Simultaneous news from Burgess and Stuart Larsen at Fraser Yachts that they've jointly listed for sale a new build 81 metre motor yacht named Project Shark. Further features include a spacious sun deck with Jacuzzi, sun pads, bar and lounging areas, a large tender garage to accommodate two tenders and an elevator to all guest decks. Her projected cruising speed is 15 knots with a range of 7,000 nautical miles at 12 knots. 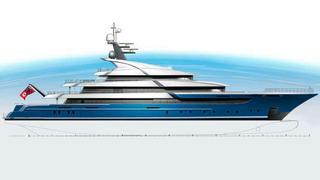 Currently in Istanbul, Turkey, Project Shark is asking €57.5 million.